Mongolia is a unique area of unsurpassed geographical and human diversity, with forest, desert, steppe and lakelands populated by over fifteen distinct ethnic groups. 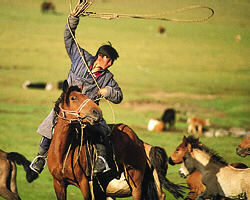 Horses are woven into Mongolian song, verse and history. Infants are taught to ride before they walk, and a young man’s prowess is measured by his skill as a horseman. 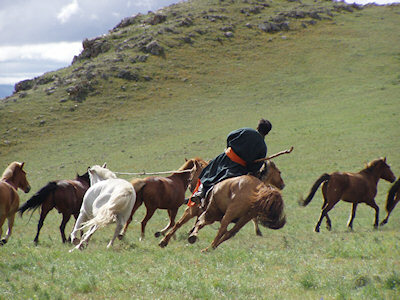 The 4 rides in Mongolia are unique in terms of landscape, culture and pace. All are ideal for an adventurous group to experience a way of life unchanged since the days of the Golden Horde, when Ghengis Khan’s cavalry created the largest empire the world has ever known. Karakorum Ride with Naadam Festival proceeds through the Khangai Mountain range in Central Mongolia which is drained by some of the country's mightiest rivers. The Orkhon is the most famous of them. For thousands of years the Orkhon and its feeding rivers gave water and shelter to the nomadic peoples and their animals. Until today their lifestyle has changed little; they still herd their sheep with horses and yaks, protecting them against the misfortune of the harsh weather and wolves. Local horsemen will accompany you and take you to their homeland and secrets of survival. Khentii Wilderness Ride - This is a packtrip into one of the world's most inaccessible regions. Cross high mountain passes, ford rivers, ride through tundra and taiga forests to reach Black Lake in the heart of this truly pristine landscape. The Mongolian Classic with Naadam Festival tour combines the lush beauty of the Blue Khentii Mountains and the austere landscape of the Gobi Desert with the colorful Naadam Festival, a celebration of Mongolia's three national sports: wrestling, archery and horseback riding. On the Spirit of the Reindeer Herders, from camps deep in the mountains of the north riders explore the heart of this remote region and meet the nomadic herding families. Riding holidays in Mongolia show the traveler how important horses can be to a society.